Welcome welcome welcome to our Holiday Card Blog Hop. We have all been busy like little elves making cards to show you. And Joy is having a give-away on her site, so be sure to take a look. You can click right here to see. The only die I used on this was a little square from Spellbinders to make that brown tree trunk. The real star of the show is the sentiment from the new limited edition Wintery Puns stamp set. Click here to see it. You will fall in love with it! I hope you've had fun blog hopping today. Your next stop on the hop is Tracy's blog, The Pickled Owl. She has something wonderful to show you....so hop on over. If you missed any of the blogs, you can still take a look by clicking the links below. Happy Hopping! Oh - by the way - I liked this little card so much that I made another one to show you tomorrow. The same - but different. Stay tuned! Love Love Love it.. 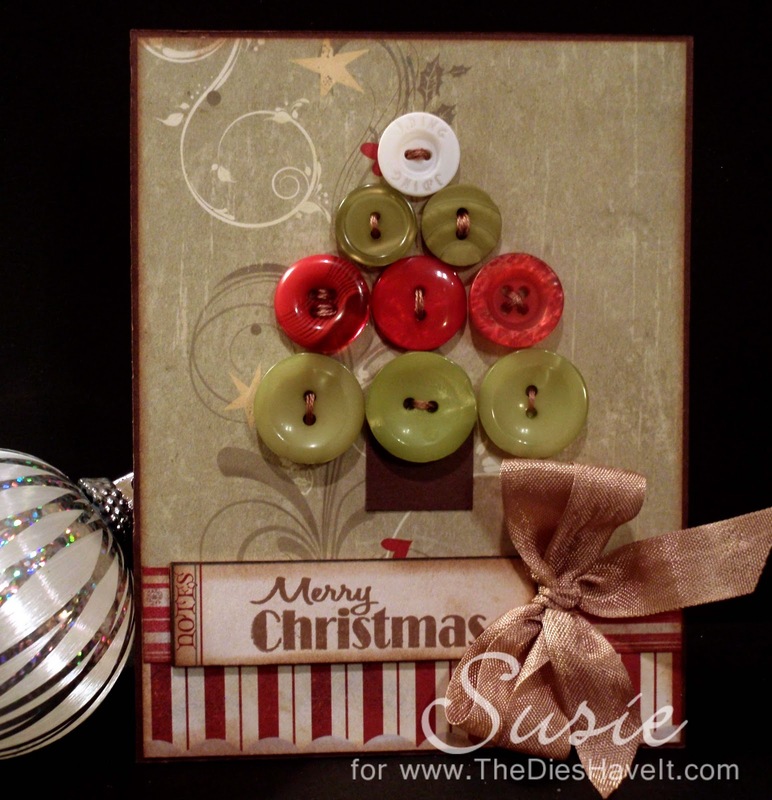 I love buttons and this is just such a sweet card.. beautiful as always Susie. Hoppy Hop.. I love the buttons made into a tree....so cute! ack! I LOVE your button tree Susie!! I've been wanting to make one and haven't yet! Thanks for the inspiration! Can't wait to see what you'll share tomorrow! I love that button tree! So adorable! This is so cute! I love the button tree! Great card. Love the vintage feel to it and I love the buttons for a tree. very cute button tree! sooo creative! great job! Great card...I like the button tree! Beatiful card, i love how you made a tree out of buttons. lovely card. What a sweet, sweet card. Susie! I love the cutton Christmas tree idea. That paper is beautiful too. Wow, your button tree cards are both lovely!!! Great color choices on both of them. That is gorgeous!! I love the different colors in the buttons!! You make amazing bows, I am terrible with bows!! TFS!! Take Care!! I think this will be one of my new favorite places to go... you are so talented and I just can't wait to see what you will do next... Your button tree is amazing... what an idea! very pretty so cute too. Your button trees are so cute! (Both cards!) What a fun project to create! Beautiful card. Love the idea of a button tree!